Once lodged, the appeal will be heard in a higher court in Madrid. MADRID (AP) — Lionel Messi and his father were sentenced to 21 months in prison for tax fraud by a Barcelona-based court on Wednesday, with both sentences likely to be suspended. The court found the Barcelona star and his father, Jorge Horacio Messi, each guilty of three counts of defrauding tax authorities of 4.1 million euros ($4.6 million). In Spain, sentences of less than two years for first offenses are usually suspended, meaning neither man would go to jail. That decision, however, rests with the court. The court also fined Messi 2 million euros and his father 1.5 million euros. Messi's management company said later on Wednesday that Messi and his father would appeal the sentences. Once lodged, the appeal will be heard in a higher court in Madrid. 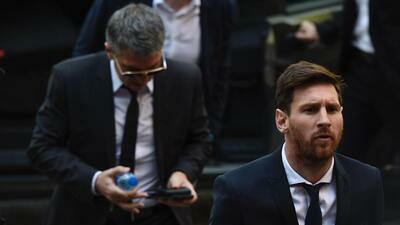 During the four-day trial last month, Messi and his father denied any wrongdoing. Both said the player was unaware of the tax issues that led to the fraud charges. But the court agreed with the state prosecutor that Messi and his father did have at least some knowledge of the corporate structures created to lower his tax burden in Spain. Tax inspectors testified that they found evidence that Messi's father used companies in countries such as Uruguay, Switzerland and Belize to reduce tax on the player's income from image rights. Messi's father said he was told by a legal adviser that the practice was legal. Barcelona issued a statement to "give all its support to Leo Messi and his father." The club said that it "considers that the player is in no way criminally responsible with regards to the facts underlined in this case." "FC Barcelona continues to be at the disposition of Leo Messi and his family to support him in whatever action he decides to take in defense of his honesty and his legal interests," it said. The 29-year-old Messi is Argentina's career-leading scorer with 55 goals in 113 international appearances. But he has lost three Copa America finals with Argentina — in 2007, 2015 and 2016 — and announced his international retirement after last month's penalty shootout loss in the final to Chile. With Barcelona, in contrast, Messi has won four Champions League titles, three Club World Cup trophies and eight Spanish league titles. The forward has scored a Spanish league record of 312 goals.